If you don't want a seven foot sofa, don't get one. If you don't want a six foot iguana, don't get one. Seems pretty simple to me..."
Green Iguanas are kept by many people. Unfortunately, relying mostly on faulty information obtained at the pet store and even from some veterinarians, many of them are also kept incorrectly. This page is here to help you get your Green Iguana set-up and fed correctly. Please click on the links here for more detailed information about Heating, Lighting and Diet. Your Iguana will be healthier and happier for it. For more anecdotal information specific to the iguanas I keep as pets click on their names over on the left. Proper temperatures are extremely important for the well-being of the Green Iguana. Iguanas require a basking temperature of 95 degrees F for proper digestion of food. That said, the rest of the tank/cage should cool off to the mid 70's to 80 degrees F, creating a thermal gradiant. The entire cage should not be in the 90s or the iguana will get stressed. There are a variety of heating devices out there. See my Heating page for a more detailed description. Iguanas require UVB lighting. Without it they will get very sick and can even die of Metabolic Bone Disease. The UVB is what allows them to metabolize calcium in their diet. There are several ways to provide UVB. See my UV Lighting page for a detailed description. Also see Calcium Deficiencies: The "Secret" to Avoid Them. 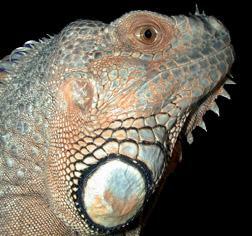 Green Iguanas are VEGETARIANS. They need a wide variety of vegetable matter to do well in captivity. 80% of their diet should come from leafy greens. Iceberg lettuce should never be used. Green Iguanas should never be fed animal protein or insects of any sort. See my Diet page for detailed diet information. You will need the Free Quicktime Player to view this file. Be patient. It is nearly 2 megs. I got Pugs in March of 1994 when he was about 2.5 years old. He was given to me by a woman that was moving and couldn't take him with her. She was adament that I feed him "Fisherman's Stew" cat food. I argued that Iguanas are vegetarians! Well, after awhile I agreed to feed him the cat food just so she would give him to me. It seemed easier that way. To make a long story short I took Pugs and fed the cat food to my cats. Since then Pugs has had the proper iguana diet. 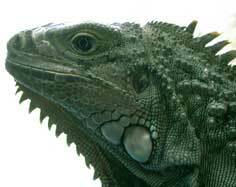 For great info on proper Iguana nutrition consult Melissa Kaplan's Iguana Care Collection. It's NOT as easy as feeding them lettuce and leaving them in a 10 gallon aquarium. And before you hit the Iguana Den Diet page, click here for the facts. I believe the Iguana Den Diet definitely has it's merits but so does the MK diet. Click here for my 3-Page Iguana Quick Guide. It's concise but packed with useful information. Pearl came to us as a rescue in September of 1999 on National Iguana Awareness Day. She was 46 inches long living in a 33 gallon breeder tank. This tank was only 30 inches long. She freeroamed my "reptile room" with Pugsley and they got along great for over one and a half years. She successfully laid 82 eggs in April of 2000. Unfortunately she produced 105 eggs in the spring of 2001. They were too much for her to handle and she died in a spay operation in May of 2001. Click here to go to her page. She is missed terribly. I can recommend this book wholeheartedly. Anecdotal and interesting	to read. New Edition! I have not read the new version but the old one was excellent. This one can only be better! Excellent information in an easy to read format brought to you by "The Dummies" people. Easier to read than her site in my opinion. I have not read the newest edition. The last one recommended feeding a small amount of animal protein which has been believed to be incorrect for years. I think Susan Donoghue wrote the diet part this time and I have the utmost respect for her and her opinions. This should be an excellent book for a reasonable price. A very good inexpensive book all about iguanas. Enjoyable to read. Great dietary and husbandry information in a hardcover! Read the information at the next sites carefully and make educated decisions on what to feed your iguana. All this info is excellent. Dr. Ivan Alfonso, DVM gives an EXCELLENT description on how to avoid Metabolic Bone Disease in reptiles. An interesting discussion about two of the oldest Iguana Diets on the net. by Melissa Kaplan, copyright 2002, FREE Online. Excellent, up to date Iguana iguana care. Melissa has taken a lot of care and effort to keep this page up and running. You can access this huge wealth of information for FREE. A relatively new organization made up of a group of individuals whose mission it is to get proper iguana care information to the masses. READ THEM! You've got nothing to lose and everything to gain!